Yields on Spanish real estate assets have improved in a year, according to the latest report for the second quarter, published by Idealista.com, a property portal. Even the least profitable property assets yield double the rate offered by 10 year Spanish Government bonds. The full comparative table of yields by type of property and region prepared by Idealista is at the bottom of the page. Commercial real estate remains the best Spanish property investment, with a gross annual yields of 7.6%, up from 6.2% a year ago, according to the research done by Idealista. By region, the best returns are to be had in Cordoba (9.2%), followed by Granada (8.5%), Las Palmas de Gran Canaria (8,3%), Málaga (8,1%), Zaragoza (8%), Madrid (7,6%) and Barcelona (7,5%). At the other end of the scale, the Valencian province of Castellón (Costa del Azahar) offers the lowest commercial property yields (4,6%), followed by Salamanca (5,3%) and Cádiz (5,6%), home to the Costa de la Luz. The least attractive yields by type of property come from garage parking space, which offered an average yields of 4.6% at the end of Q2, but even that is twice as profitable as 10-year Spanish Government bonds, Idealista point out. Garage parking investment yields were as high as 5.6% in Toledo, and 5.3% in Las Palmas de Gran Canaria, and as low as 1.6% in A Coruna, and 2.3% in Barcelona. Residential rental investment yields have increased over the last 12 months, say Idealista, to 5.5% at the end of Q2, compared to 4.9% a year ago. Lerida, in Catalonia, is the provincial capital that offers the highest residential rental returns on 7.8%, followed by Las Palmas de Gran Canaria (6,2%), Palma de Mallorca (5,8%), Huesca (5,7%) and Huelva (5,7%). Spain’s two biggest cities don’t offer the best returns. 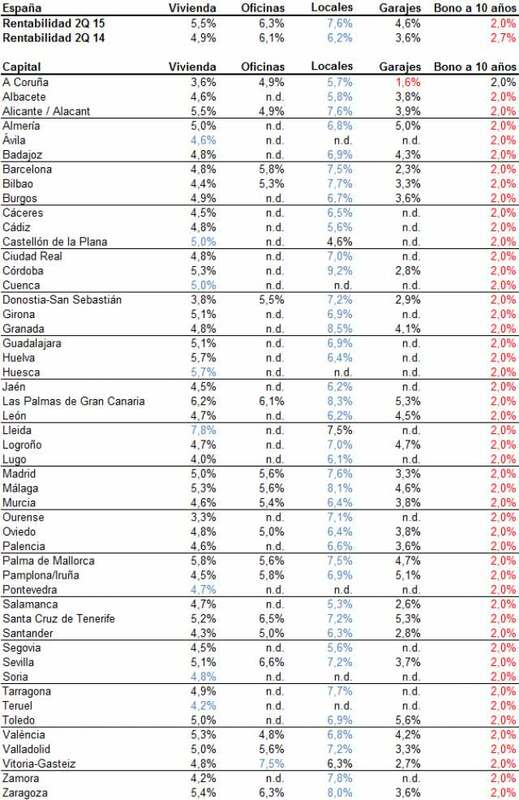 Madrid offers an average of 5%, a fraction better than Barcelona on 4.8% in Q2. The least interesting returns come from the North of Spain, with Ourense (3.3%), and A Coruña (3,6%) – both in Galicia – followed by San Sebastián (3,8%) in the Basque Country. On average, office space in Spain yielded 6.3% gross at the end of Q2, according to Idealista. Yields vary from 7.5% in Vitoria, to a low of 4.9% in Alicante. Barcelona yields 5.8%, and Madrid 5.6%. Idealista were unable to collect figures for more than half the number of provincial capitals. Idealista used the asking prices in its database for both sale and rental to calculate gross yields by property type and region. Rental asking prices (in €/m2) divided by sales asking prices give a rough guide to gross yields, though not as accurate as one based on actual transaction prices.